Electric Power Steering (EPS) is a technology which uses electric motor instead of hydraulic pressure to assist automobile steering. As computerized control of the entire automobile system develops, the adoption of EPS increased, giving high degree of freedom in control and reduction of weight compared to hydraulic pressure system bringing the biggest advantage which is the improvement of fuel economy. Improving stability of a vehicle by coordinated controlling of break and throttle in addition to EPS, and support for parallel parking and parking in garage by coordinating Intelligent Parking Assist (IPA) movement both relates and contributes to automated driving system development. Torque which is the driver's power to control the steering wheel is transmitted to torsion bar and rack & pinion gears. This power then gets detected by torque sensor and transmits to the ECU. 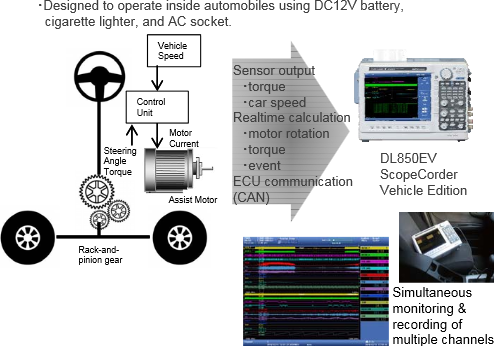 ECU then applies electric current (amount of power assist) according to the torque and car speed. EPS system development and evaluation requires to monitor and record numerous amount of signals such as sensor (car speed, torque, torsion, axial tension of rack, battery power) signals (mostly voltage output through amplifiers), and amount of power assist calculated by ECU in addition to three phase motor electric current/voltage/rotation amount). Also, it requires long memory to continuously record for 10-20 minutes or more. DL850EV is ideal for designing and evaluating EPS system since it is able to record necessary signals to multiple channels for long period of time in addition to realtime monitoring and recording of motor rotation angle by combining 4CH 1MS/s 16 bit insulation module and CAN bus monitor module. Displays communication data trend waveform on the screen. Compare and verify mutual relation of signals by displaying with trend waveform of a sensor signal on the same screen. Capable of measuring 100kS/s, 16CH simultaneously for about 10 continuous minutes (/M2 option). Continuous recording up to 200 days on to internal hard drive (/HD1 option).